August is National Immunization Awareness Month (NAIM), an annual observance to highlight the importance of vaccination for people of all ages. Immunizations are a highly cost-effective form of preventive medicine that protect health and save lives. The public health system that plays such an important role in making sure people receive their recommended immunizations must be supported. 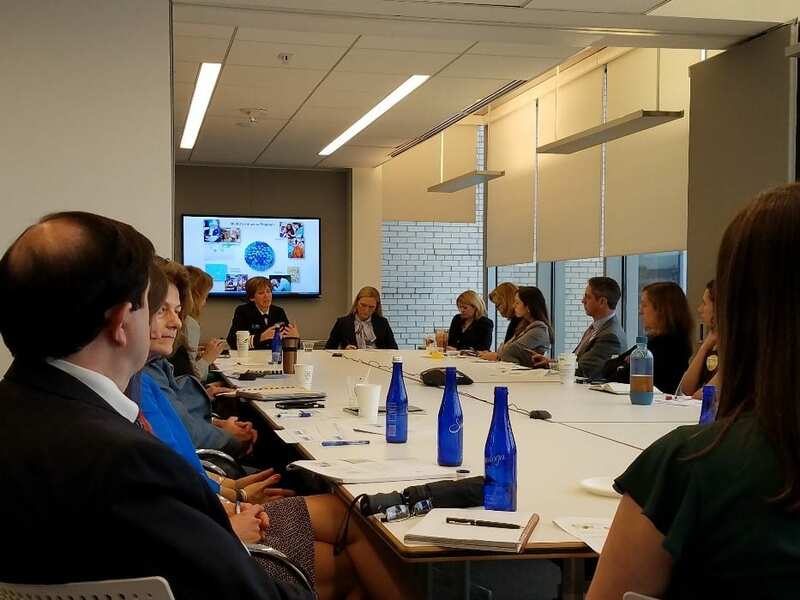 In June, the Adult Vaccine Access Coalition (AVAC) hosted a meeting with Nancy Messonnier, MD, director of the National Center for Immunization and Respiratory Diseases (NCIRD) at the Centers for Disease Control and Prevention (CDC). It was an informative session on the how many different ways NCIRD is working to prevent disease, disability, and death through immunization and management of respiratory and related diseases. The Immunization Program within NCIRD is working through core public health immunization programs at the local, state, and federal level to preserve gains already achieved, particularly with respect to our nation’s high childhood immunization rates. These programs are engaged on a multitude of fronts, including working to maintain and increase vaccination coverage rates; making strategic investments to modernize immunization and laboratory infrastructure; investing in pandemic influenza preparedness, including improved vaccine virus selection; facilitating vaccine purchase as safety net against uninsured vaccine-preventable disease outbreaks; and improving detection and response to respiratory diseases domestically and globally. With such a vital and crosscutting portfolio, it’s concerning that the Trump Administration budget proposed massive funding cuts to the Immunization Program, to the tune of $82 million and the House Appropriations Committee cut the program by $50 million in their funding bill. Cuts of this magnitude will significantly curtail the Immunization Program’s ability to provide direct vaccine assistance and support to states and local communities responding to outbreaks. Many of these funds go directly to states and local governments that will be unable to make up the reductions in funding on their own. As if the proposed budget cuts aren’t bad enough, the proposed repeal of the Prevention and Public Health Fund (PPHF) in the House and Senate health care legislation would have an even more detrimental impact. The PPHF makes up nearly half of all federal funding sent to states and territories to conduct core immunization program activities. At AVAC, we are especially concerned that adult vaccines would be at risk if these proposed cuts come to fruition. Despite the overwhelming body of research demonstrating the clear health and economic benefits of vaccines, more than 50,000 adults die from vaccine-preventable diseases in the United States every year. Each of these lives represents someone’s loved one – a grandmother, grandfather, parent, beloved family member or close friend. Gaps in vaccine coverage not only leave our nation’s citizens vulnerable to common but potentially deadly conditions such as the flu, but also to emerging threats such as Ebola or Zika where scientists are racing against the clock to develop new vaccines. As a coalition, we continue to educate policy makers about how the CDC Immunization Program works to prevent—and mitigate—disease outbreaks, strengthen the adult immunization infrastructure, and works to improve adult immunization rates. We encourage others to also reach out to Members of Congress and the Trump Administration and let them know about the importance for vaccines, and of your support of full funding of Immunization Programs.